When is this calculator suitable? You can use the calculator for all fluids and flow rates without any restriction. The calculator applies to fluid mixtures also, but you have to enter the viscosity of a mixture. Reynolds number named after Osborne Reynolds (1842 – 1912), gives the relation between inertial and viscous forces of fluid flow. If inertial forces (flow rate) are much bigger, and Reynolds number is higher than critical, Re > 2320, fluid flow is turbulent, and if viscous forces are big enough in comparison to inertial (flow rate), Reynolds number is lower than critical, Re < 2320, fluid flow is laminar. For calculation of Reynolds number in closed pipe fluid flow average velocity, fluid viscosity, and internal pipe diameter should be known. Reynolds number is proportional to fluid flow average velocity and pipe diameter and inversely proportional to fluid viscosity. 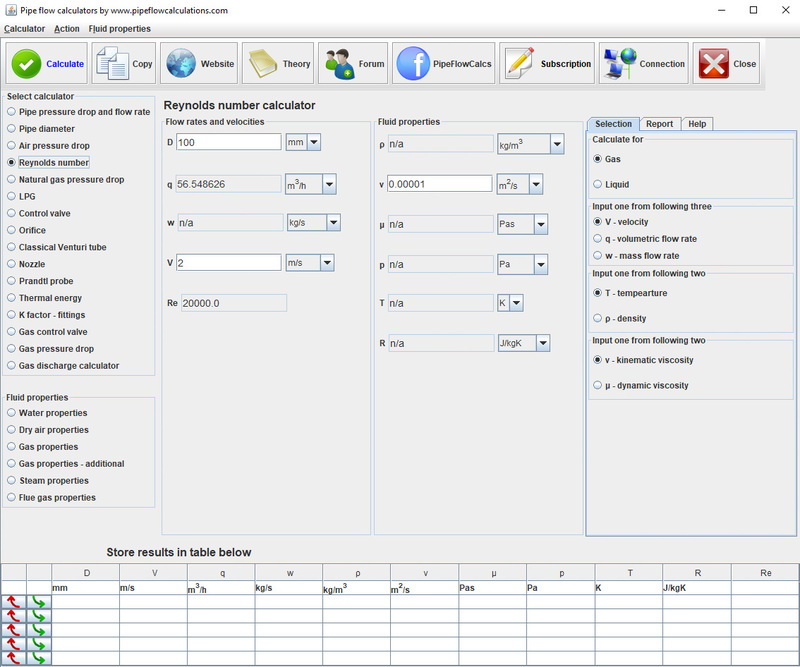 With Reynolds number calculator you can analyze what makes fluid flow regime laminar and what is needed to force the fluid to flow in the turbulent regime. For example - in pipes with minimal internal diameter it is more likely to have laminar flow regime with small Reynolds number even for a fluid with low viscosity. In fluid flow with temperature change flow regime can change from turbulent to laminar flow regime, as viscosity is changing depending on the fluid temperature.